What are volcanoes? How Are Volcanoes Formed? A volcano in eruption is one of the most dramatic, fascinating, terrorizing, and awesome displays of the destructive power of nature. A mountain that suddenly blows up into a mountain of fire, gases, rock and ash can change our lives in a hurry! 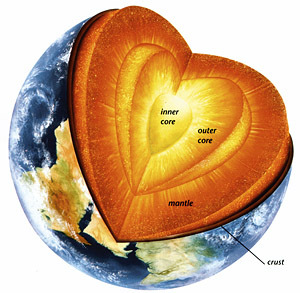 The earths iron rich core is surrounded by the ‘mantle’ which is made up of very hot viscous rock and makes up 80 percent of the earths total volume. The innermost part of the mantle near the core consists of solid rock, but at a temperature of 5,400 degrees F (3,000 C)! The reason the extremely hot rock does not melt at the deepest regions of the mantle is because of the incredible pressure that is exerted upon it at that depth. The outermost part of the mantle closest to the surface of the earth (about 7 miles beneath our feet – 10 km) consists of molten liquid rock at temperatures ranging from 2,500 degrees F to 5,400 degrees F (1,400 – 3,000 C). This molten rock, or magma, is what will become a volcano if it finds it’s way to the surface. Above the mantle, the earth directly beneath our feet consists of 16 major tectonic plates that drift around very slowly on top of the molten rock or magma. As the plates drift, the boundaries push into each other, pull away from each other, one may dive underneath or over the top of the other, or they may slip horizontally past each other. 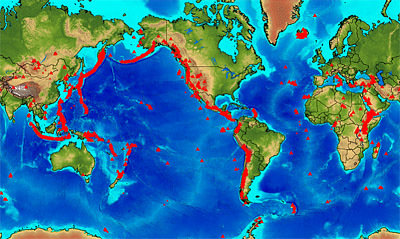 Some famous tectonic plate boundaries include the Mid-Atlantic Ridge and the Ring of Fire in the Pacific. When plates bump together, we get earthquakes. When openings (or vents) form at plate boundaries, magma (molten rock) from the mantle works its way up to the surface to form a volcano. At tectonic boundaries where there are openings or vents from the earths mantle, magma will slowly rise up higher, all the while getting hotter the closer it reaches to the surface. 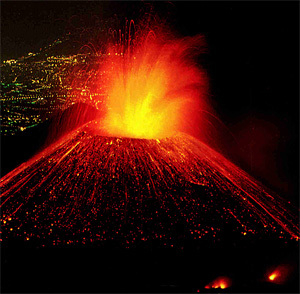 The magma will pool in chambers and eventually may reach the surface through fissures and vents as a volcanic eruption. A violent volcanic eruption can occur if the magma that is rising up from the mantle is thick and contains high enough levels of water and gases which turn into a steamy pressurized mix and build up very high pressure as it rises to the surface and eventually blows through a plugged vent above it. Sometimes this type of eruption is so violent that part of the volcano, or even the entire volcano will blow itself up and leave just a caldera behind. Other eruptions of thinner magma containing not so much water or gases will erupt plumes of molten rock which will flow down the sides of the volcano as lava. Although most volcanic eruptions only affect people in their immediate vicinity, it is the other more violent volcanic eruptions that can change global climate and even have worldwide deadly consequences, that we need to be ready for. The recent awakening of the Iceland volcano, Eyjafjallajokull, knowing that it’s neighbor, Katla, always blows it’s top shortly afterward with ten times the power, has increased the awareness of one of natures most powerful forces. Even worse is the threat of a super volcano which would truly change the world as we know it.